As seen in the Star Wars Rebels television show, the Imperial light cruiser is a communications and blockade ship used to help the Empire spread its domain throughout the galaxy. 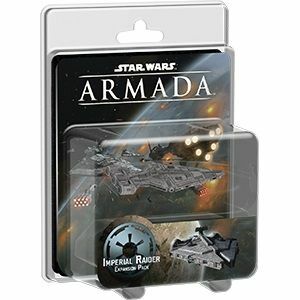 In Star Wars™: Armada, the Imperial Light Cruiser Expansion Pack presents this ship as a fast, small-base Imperial vessel that excels at providing long-range fire support from its broadsides. With its ship, its two ship cards, eight upgrades, and all requisite accessories, the Imperial Light Cruiser Expansion Pack will have you racing around the Rebels' flanks and into a new era for Imperial tactics!